On 8 March 1941, a 27-year-old Dutch Jewish student living in enemy-occupied Amsterdam made the first entry in a diary that was to become one of the most remarkable documents to emerge from the Nazi Holocaust. Over the course of the next two and a half years, an insecure, chaotic and troubled young woman was transformed into someone who inspired those with whom she shared the suffering of the transit camp at Westerbork and with whom she eventually perished at Auschwitz. Through her diary and letters, she continues to inspire those whose lives she has touched since: an extraordinarily alive and vivid young woman who shaped and lived a spirituality of hope in the darkest period of the twentieth century.This book explores Etty Hillesum's life and writings, seeking to understand what it was about her that was so remarkable, how her journey developed, how her spirituality was shaped, and what her profound reflections on the roots of violence and the nature of evil can teach us today. Introduction; Who was Etty Hillesum? ; Chapter 1: An Emerging Self; Chapter 2: Discovering God; Chapter 3: Refusing to hate; Chapter 4: Losing her life; Chapter 5: Seeing Differently; Chapter 6: A woman for our time. Review in Morning Star, March 2009 '[Hillesum's] inspirational reflections on the roots of violence and the nature of evil have as much relevance now as they did in the 1940s.' The Bookseller, February 2009 Mention in Cheddar Valley Gazette article, 'Evensong honours Etty's life and story', Lavinia Byrne, March 2009. Reviewed in Church Times, 26 June 2009 "For anyone involved in pastoral care, there are rich and thought-provoking resources here and Woodhouse is an excellent guide. ... Inspiring and deceptively simple book." The Pastoral Review, May/June 2010. "Etty was pyschologically complex to say the least, and her story presents us with a disturbing and challenging spirituality for a world wracked with hatred" The Tablet 22 August 2009 "A touching and wonderful book" The Goood Book Stall. "This is a very precious book that left me feeling very grateful for the life of Etty Hillesum. Patrick Woodhouse has written about her with a clarity and unobtrusive simplicity that is wholly appropriate." One in Christ, Vol 43.1--Sanford Lakoff "Complicated, intelligent, passionate and disarming by turns, Etty Hillesum is interpreted here as a woman for our time. 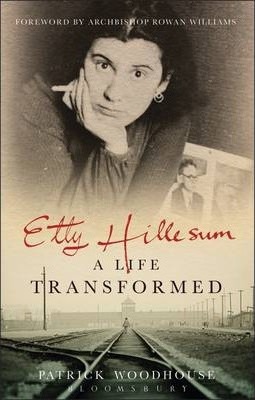 The forward to the book, written by the Archbishop of Canterbury, argues that by examining the life of Etty Hillesum, the reader is able to understand how a theology of hope and of the redemptive meaning of suffering can emerge, even from the darkest of contexts." - Lavinia Byrne, Cheddar Valley Gazette, March 2009--Sanford Lakoff "[A] superb and moving account of her life and writings, touching on Hillesum's profound reflections on violence and the nature of evil." Patrick Woodhouse is Canon Precentor of Wells Cathedral. He is the author of In Search of the Kingdom (Marshall Pickering, 1989), Beyond Words: An Introduction, Guide and Resource for a Contemplative Way of Prayer and With You is the Well of My Life, a collection of prayers for public and private use (both published by Kevin Mayhew).